Window boxes are miniature gardens that add instant color and charm to the outdoor environment, and choosing flowers for your window box is part of the enjoyment. Nearly any flower can be planted in a window box, as long as there is adequate sunlight and water. 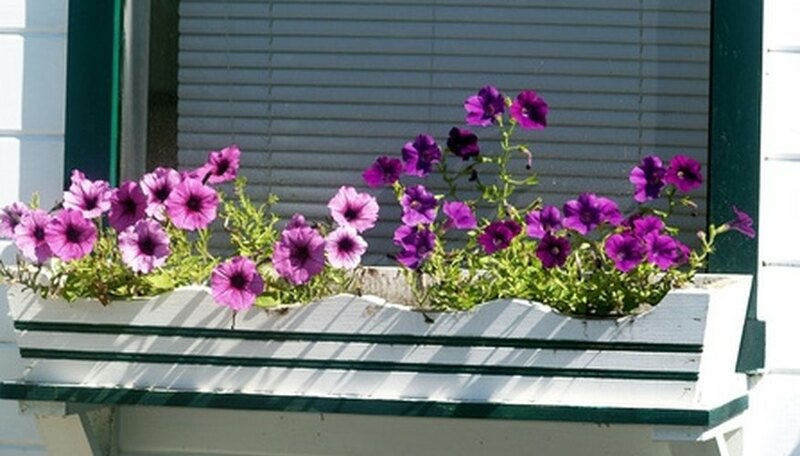 Annual flowers add instant color to a window box, with most annuals blooming from late spring until the weather turns cold in autumn. Marigolds, with their upright stems topped by orange, yellow or gold blooms are a good choice for a window box in a sunny spot. Dwarf zinnias, available in a rainbow of colors, are compact enough to fit easily in a window box. Pansies are cool-weather flowers that will add color in late autumn or early spring when most flowers are still dormant. Unlike annual flowers that last a single season, perennial flowers return year after year. However, most perennials grown in a window box will need extra protection during the winter. With big, bright blooms that last all season, geraniums are traditional window box favorites. The tiny blooms of baby's breath or blue bell's graceful, dangling blooms provide contrast with the bigger blooms of cheery asters or daisies. Salvia, available in bright blue or red, will attract hummingbirds and butterflies to your window box. While most annuals and perennials require several hours of bright sunlight per day, it's possible to enjoy a colorful window box even in partial shade. Impatiens and begonias are annuals that will fill your shady window box with color and beauty for most of the summer, although an hour or two of morning sunlight is best. Fuschia is a shade-loving, cool weather plant that will dangle delicate, droopy blooms over the side of your window box. Lily of the valley, periwinkle and viola, all perennials, will do well with very little sunlight. Although petunias are available in bush form, the colorful blooms of trailing petunia varieties will cascade over the side of your window box. Cascading varieties of lobelia will provide masses of miniature, intensely colored blooms. Trailing lantana, lotus vine and moss rose are good choices for window boxes in hot, dry climates. Ask the Plant Lady: What Exactly Do You Put in Planter Boxes? What Are Summer Annual Flowers? What Flowers Bloom From Spring to the Fall?